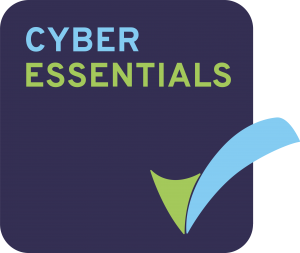 We are now, officially, Cyber Essentials Certified. 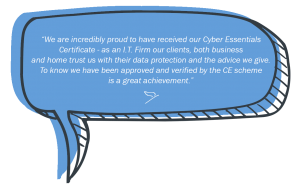 Dove Computer Solutions Ltd have recently gained their government backed Cyber Essentials (CE) certification and are delighted to receive it. We are currently the only Ashbourne I.T. firm, and one of the few in Derbyshire, to hold a CE certificate. It’s all a part of the government’s plan ‘to make the UK one of the most secure places to do business in cyberspace’ and will protect us against the growing cyber threat. The CE programme requires a company to run extensive internal and external security checks on a self-assessment basis that is later verified and checked by the CE provider. – are your passwords, usernames etc. secure? Do you have limitations on user permissions? Are all files appropriately encrypted? – does your server use an effective firewall? Does your anti-virus block potentially malicious content online? – are your operating systems up to date? Are you running licensed programs or fake copies? – do you have any anti-malware software and measures in place? Does your anti-malware software blacklist unsafe websites? – are your passwords changed frequently? Do you have an access management system in place? This means that, as an I.T firm for business and home clients we will be able to supply our customers with, not only the best possible secure services but also give our clients the best advice on their own security. We offer Wi-Fi installation, server and router installation, the top rated anti-virus, data backup options and hard drive encryption – just to list a few of our many services. Our CE certification has proven that our practices are in fact as secure as we believed and that the advice and services we are providing our customers with is essential in helping them form a safe and secure network. Our CE certification makes no difference to our price, nor our morals but gives us pride of knowing we are providing the best and safest possible services to our customers. What does this mean for our business clients? In the countdown towards GDPR, our Cyber Essentials certification helps prove our security in relation to compliance but also proves our ability to provide an effective compliance service scheme to our current and future business clients. We offer a great deal of services to our business customers, from individual device set ups, to entire office software installations. Our vast experience with a wide range of business clients has allowed our technicians to gain an extensive skill set in the kind of set up, installation and services any business client, from any industry, may require. Get in touch today to sign Dove Computer Solutions Ltd as your company’s I.T. provider. For a list of our home services click here. For a list of our business services click here. For further information on GDPR and what it means, click here.